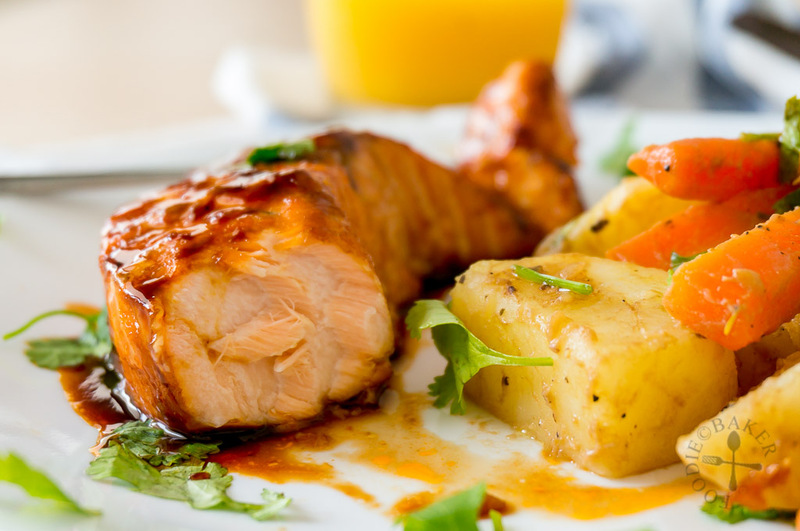 Today I’ll be sharing a simple, short, and spicy recipe for baked salmon fillets. We eat salmon fillets almost once every week and while I still prefer the sear-then-bake method as the salmon skin will be more crispy, nowadays I just bake them straight as clean-up is so much easier (one less pan to clean and no oily or fishy kitchen). 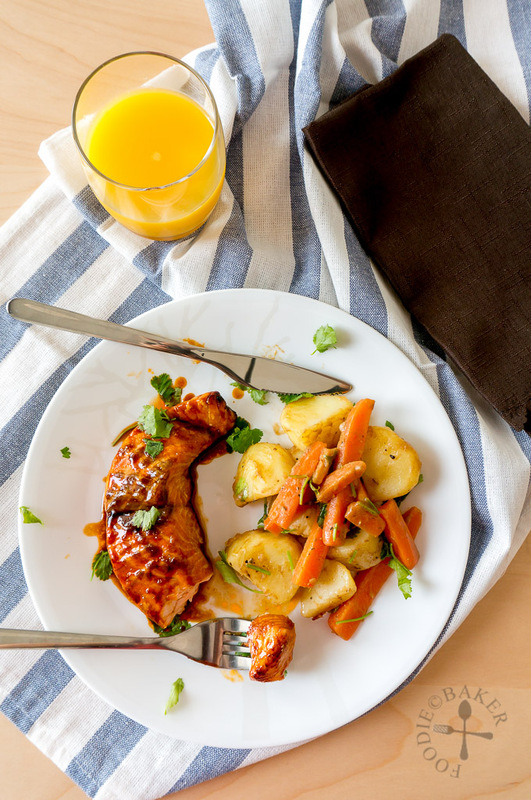 I discovered this honey and sriracha combo a few months back while I was thinking of ways to use up the bottle of sriracha at home – and I’ve been baking salmon fillets this way since then because we couldn’t get enough of it! 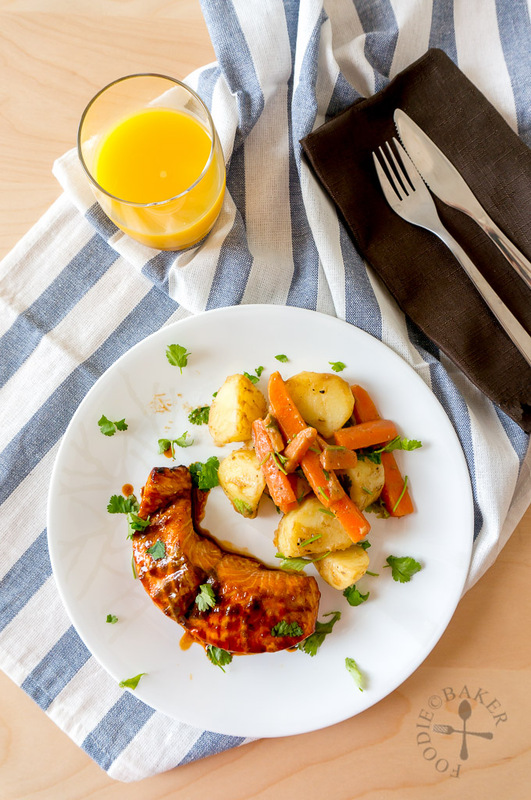 This honey-sriracha salmon is very similar to the Baked Gochujang Salmon I made last time but it’s a lot easier as only 4 ingredients are needed – soy sauce, honey, sriracha and salmon! 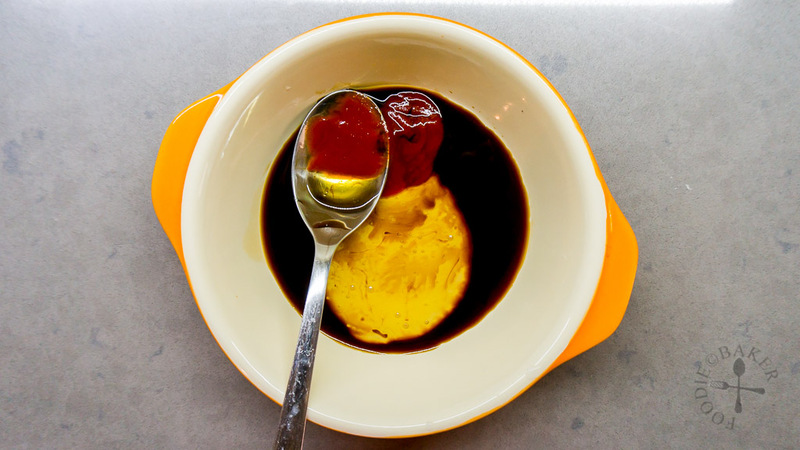 The soy sauce provides the saltiness, the sriracha the spiciness, and the honey to offset the spiciness a little and to thicken up the sauce while it caramelises in the oven. It also requires minimum preparation as there’s no need to marinate the salmon fillets in advance. Just toss all the ingredients together in a baking dish, then toss the baking dish in a preheated oven and wait for the magic to happen! The salmon skin won’t be crispy as the salmon fillets will be coated with sauce all over so we usually leave the skins untouched (what a waste I know). However, if I have the time, I will skin the salmon fillets as best as I can and bake them separately, seasoned with salt, black pepper and whatever spice I like, until crispy to make some awesome crispy salmon skin snacks before dinner. 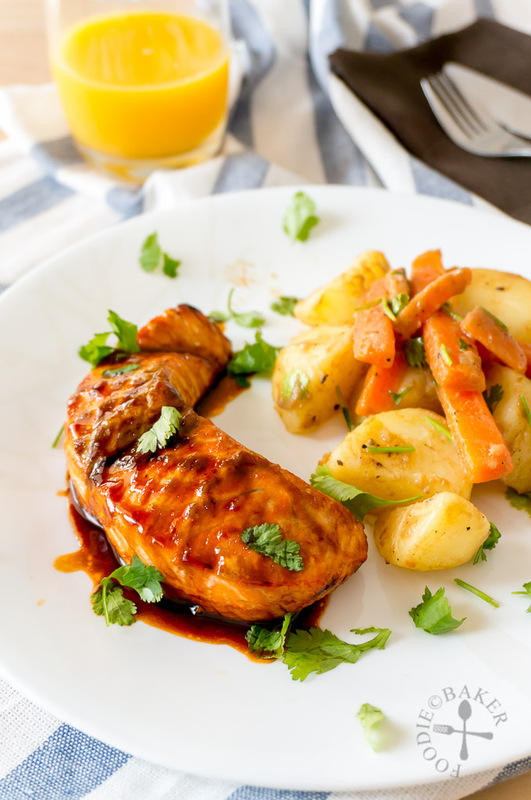 Even though X and I are not very good at eating spicy food, we really love this honey-sriracha salmon – there’s this shiokness in every spicy bite that got us addicted. The sticky sauce is also so exceptionally good over rice that sometimes I will double the sauce amounts so that X can have extra sauce to drizzle over the rice. I usually serve the salmon with rice, but just for this “photoshoot”, I whipped up some warm potato-carrot salad dressed in my favourite balsamic and mustard dressing instead. And here are the step-by-step photos – which, really, I don’t think anyone need them, because it’s too easy! Stir soy sauce, honey and sriracha together in a baking dish to make a sauce. Coat the salmon fillets in the sauce thoroughly and bake until it’s done! Serve with whatever you like! 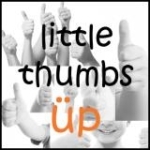 This post is linked to the event Little Thumbs Up (March 2015 Event: Honey) organized by Zoe (Bake for Happy Kids) and Doreen (My Little Favourite DIY) and hosted by Joyce (joycescapade.com). Yield: Serves as many as you like! Preheat oven to 180C / 355F (with fan assistance) or 200C / 400F (without fan assistance). 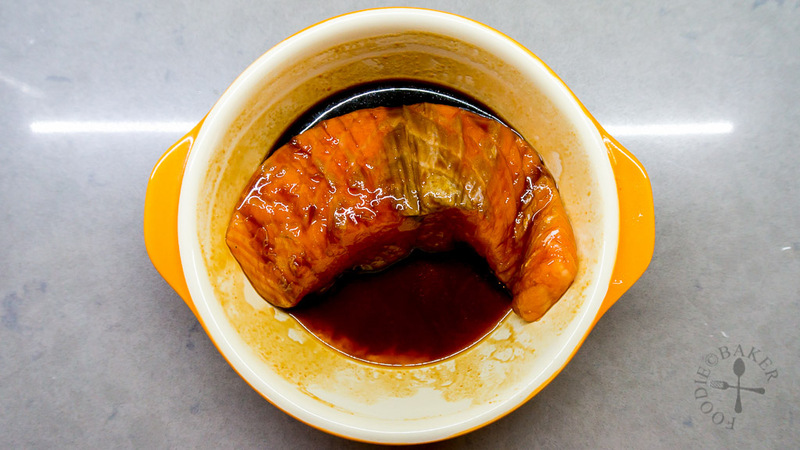 Mix soy sauce, honey and sriracha in a shallow baking dish. Rinse and pat dry salmon fillets with paper towels then add them into the baking dish. Flip to coat them in the sauce. Place the baking dish in the middle rack of the preheated oven and bake for 12 to 15 minutes, until the salmon is cooked. Transfer the salmon fillets onto serving plates and drizzle the thickened sauce over. - The skin will not be crispy, so do remove it if possible and bake/fry it separately to make crispy salmon skin! - If you like more sauce, double the sauce quantities. - The salmon goes especially well with rice, but a simple tossed salad will work well too. Hi Foodie Baker. This dish looks so delicious. Same sauce I used for my baking my chicken wings. I will try salmon the next time. This looks amazing! I really need to start cooking with salmon! Jasline, I will definitely try this recipe…it sure sounds and looks delicious…sweet and spicy…yum…and so easy! It’s okay to take breaks now and then. Otherwise it’s all work, and that gets tiring! This salmon looks amazing .It hits all the flavor needs! Thank you so much for stopping by my blog. This recipe could not have come at a better time. I just bought some beautiful salmon today and was trying to think of an innovated way to prepare it. I now have it and I thank YOU! I’m sure it’s going to be delcious especially adding a bit of soy sauce. It doesn’t get much easier than that…the salmon looks terrific. Who says teriyaki is best with salmon, I guess this is way much better. I love the flavour profiles of this dish! Love the sweet and spicy combo and that bite into this salmon looks so good. I hope you are staying cool in the heat! Take care. Looks yummy and love your plating! What a delightful dish! The salmon looks great! I love that it’s sweet and spicy! Sweet with heat is a favorite flavor combination, Jasline. What a great way to prepare salmon! Thanks Karen! You can add more sriracha if your kids love spicy stuff! I know what you mean about the blogging part – the mood hits me too ..haha! 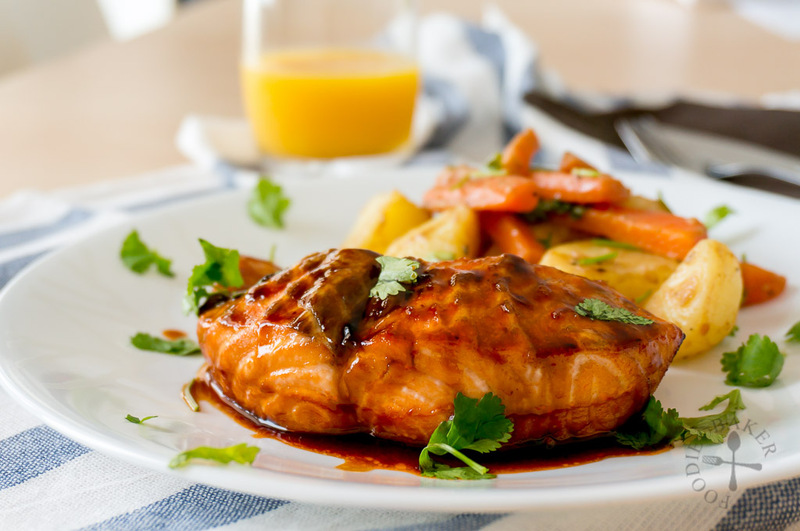 This salmon dish looks amazing, Jasline – yum stuff! So glad I’m not the only one with a blogger’s block Sharon! Thanks for dropping by!